I have had an annoying coolant leak for a while now. It seemed to only show up with it was cold out. Well today while it's warm out I notice a wet spot under the front of the van. It's coolant. I look under and I can see it dripping. It looks like it's dripping from this one part that I am not sure what it is. I have attached a pic with it circled. I thought maybe the water pump but this has a hose connected to it. If this is in fact the spot of my leak, why is this part? I took this picture from looking from the underside of the engine. The part is located on the right side of the motor. From looking at your pix, We can see some yellow coloring along the oil pan. 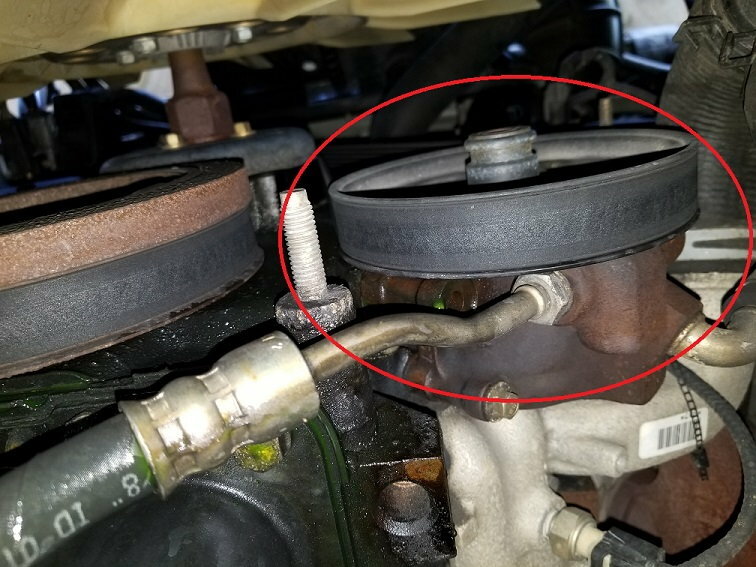 The part you have circled is the power steering pump. If you check the coolant hoses you may find one of them leaking. If the clamps are not tight they do have a tendency to seep when cold and everything contracts. The leak appears to be from up top and running down alongside the power steering pump. Just follow the trail of the yellow coolant to the source which appears to be from the top of the engine. Last edited by hanky; 03-12-2018 at 02:53 AM. I had my repair shop pressure test the system a while back and they couldn't find anything. I have it back to them this morning and if they call and say they still can't find it, I might just have then replace the water pump and hoses and see what happens. I have got to get this resolved as it is driving me nuts. It seems they have found the leak. It was the heater hose. Hose was replaced. So far It hasn't leaked since getting it back. It was cold out this morning which if it was going to leak it should have and didn't. But we shall see what the rest of the week brings when driving it around. Well I spoke too soon. Went out a little while ago and I see it dripping. So I took the air filter housing off and it looks to me the leak is coming from the right side of the crossover portion of the intake manifold. I had this part replaced about 6 years ago. Looks to be a problem again. Needless to say, back to the repair shop we go.